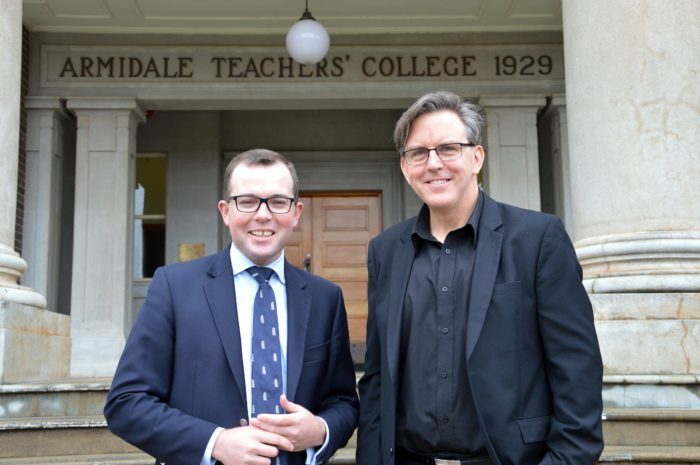 Northern Tablelands MP Adam Marshall, left, and New England Conservatorium of Music Director Russ Bauer celebrating news of the $25,000 grant to host a major composition conference in Armidale next year. A GRANT of $25,000 is music to the ears of the New England Conservatorium of Music (NECOM) which will use the funding to stage a conference next year that will see international and national composers and songwriters share their musical talents with hundreds of locals. Northern Tablelands MP Adam Marshall today announced the funding for a two-day composition conference in Armidale, likely to feature leading Australian musicians and Tony Awards-nominated and Broadway composers conducting a musical feast in October next year. NECOM Director Russ Bauer was thrilled with the funding and said the conference hoped to attract around 230 delegates, from educators and teachers to students and music lovers take part. “I don’t know of any other composition conferences where the emphasis is purely on composing; musical conferences tend to be about performance,” Mr Bauer said. Mr Marshall said NECOM was tapping into the brains of some of Australia’s and the world’s leaders in composing for the event. “I’m blown away by the inspiration behind the conference, it’s unique in its vision,” Mr Marshall said. “The fact you have such a creative and imaginative musical conference being staged in Armidale will bring a different crowd and a different focus and really put the spotlight on our musical education achievements. Mr Bauer told Mr Marshall that negotiations could now start in earnest with some conference speakers he’d already sounded out about taking part. “For many of these composers you need a lead time of over 12 months to secure people who are in such high demand, but Adam’s news for us means we can now go ahead and look to finalise contracts,” Mr Bauer said. Top of their playlist for the gig are the likes of Broadway composer and lyricist Andrew Lippa, best known for musicals like Big Fish and The Addams Family, Aussie Bruce Rowland, who wrote the music for The Man From Snowy River and was the conductor for the orchestra at the Sydney 2000 Olympics, and prolific rock/folk singer-songwriter Paul Kelly. Mr Marshall said NECOM was looking to secure up to nine leading composers – but was also in the box seat to scoring a big hit with former Test cricketer Matthew Hayden as a dinner speaker and Sunday lunch celebrity chef. “Not a lot of people would know of Hayden’s background off the cricket pitch but his mum and aunt are great musical composing talents,” Mr Marshall said. Mr Bauer said Hayden would also show off his culinary skills as a seafood chef on the conference weekend. The $25,000 for the composing conference has been awarded under the NSW Government’s Regional Conferencing Development Grants program. Mr Marshall said increasing conferences and events in NSW was a key priority because they were a significant growth opportunity for regional destinations. “They bring added business to local restaurants, cafes, venue attractions and accommodation providers,” Mr Marshall said.